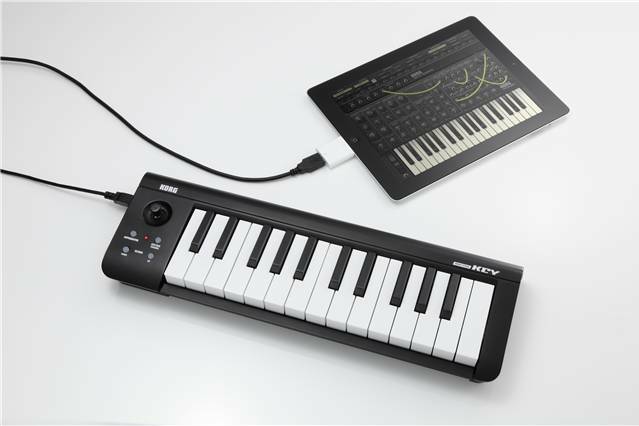 I just received and tested the new Korg Microkey 25 keyboard controller with my generation 1 iPad and it works fantastic! 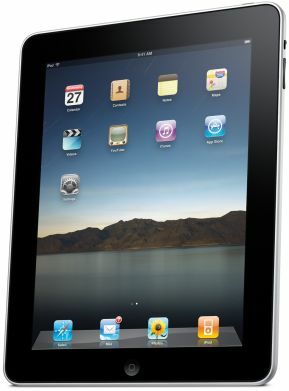 I also have the iPad2 and it works great with that as well using Garageband. This week I’ll be taking a trip from Japan to the States and really wanted something I could connect to the iPad and jam with on the flight over. The Korg Microkey 25, iPad, and iPad camera connector looks like it’s going to work very well. The Korg Microkey 25 is very light and the keys feel pretty good to my fingers. It’s two octaves but if you are proficient at practicing with good voice leading and are eager to create some new compact voicings, the size shouldn’t bother you one bit. I like playing with clusters so it should bother me much. I also could use more practice with alternate voicings so this should help quite a bit at getting me to do that. I find that if you play with one finger bass notes, use 5ths, or perhaps even 3/7 chord shells it should work fine as well. Playing with octaves might be tricky unless you record separate parts. Of course playing leads will work fantastic when soloing over a backing track. Some other features on the Korg Microkey 25 are a nice joy stick, arpeggiator, octave shift up/down, and a tap (arp) or sustain/hold button. I haven’t tried these too much yet, but I can say the octave shift is fast and works great. The joystick is awesome for modulation, bending, etc. For example in Sampletank there are two modulation wheels. The Korg joystick can trigger both wheels by toggling left/right and up/down to control each wheel. I haven’t tried the arpeggiator yet but I will update this post with some comments after I get more experience with the Microkey. In fact, I’ll definitely write some comments about using the microkey on the plane. I should note that when tapping the keys, they don’t make too much noise which is nice. The springs feel pretty good and overall it should work well for it’s intended purpose which is to provide a means of playing some keys on the go. I currently use the camera connection kit to connect the Korg Microkey 25 to the ipad. I thought about getting the 37 key version but learned that it might be too long for the flight and most importantly it cannot be powered by the iPad. The Microkey 25 does NOT require any additional batteries or power source other than what any of the iPads provide. This means you can save money, space, and weight with no batteries, charger, adapter, etc. Also note that I have used two apps thus far with the Korg Microkey 25. I used both Sampletank and Garageband without any issues. I will try several other apps early this week but so far I’d say it’s all plug and play. The Korg Microkey 25 came with some bundled software discounts that you can get online, plus there is a Korg Microkey editor that allows for some additional settings. I don’t think this can be accessed on the iPad, but rather you’ll need to use an actual computer. I’m not sure about this at first glance, but will review and update later. I suspect changing arp settings for example is done using the editor. Again, I’m not totally sure. All in all, I’m greatly impressed with the size, weight, and play ability of the Korg Microkey 25 WITH the iPad. It works very well and should hopefully work without issue on the airplane and while I’m waiting at lobbies which is why I purchased it in the first place. If you are looking for a more feature rich keyboard controller, you might want to consider other options which likely are longer, heavier, and with more bells and whistles. I basically needed something to specifically use on the airplane without having to tap my iPad. That’s drives me NUTS when playing the keys. Stay tuned for more updates and experiences with the Korg Microkey 25 in flight shortly. This past week I’ve been learning how to work with my new (used) Apple 1st generation iPad which I picked up for $100 bucks including the camera connection kit, adapter, and case. I saw it in the glass case over at the used music shop called Hard Off here in Nagano and thought that was to good deal not to pass up. The iPad is in excellent condition with practically no scratches. It came with the original box and so far it’s been a real joy to play with. I’ve passed on the iPads here in Japan because they are very expensive in my opinion. My wife recently bought an AU smart phone with Android and as a bonus gift she received a really cool AU Cube Wi-Fi access point that plugs right into our home network. The iPad 1st generation is the 3G Wi-Fi with 16GB version, so I was able to access the internet right away. Naturally, now that I have an iPad I wondered what sort of music apps out there might be useful for the things I like to do. Right away I’ve enjoyed loading and reading PDF programming and service manuals for the various synths I play and work on. I also have enjoyed watching instructional movie and youtube videos with the iPad right next to my music gear. I have found the iPad to be a very convenient tool in the studio when I have questions about operation or programming. Out on the road, I’ve enjoy the iPad while my girls are in Ballet or their school activities. I can pull out the iPad and read up on the synths I have or even look them up in the used music shop should I require further information. Currently I’m looking into what sort of additional cool music apps that can be loaded into the iPad. I’m primarily interested in Midi apps that allow me to export sequences and patterns that I create for later import into hardware sequencers. I’m also interested in controlling or programming synths possibly with the iPad as well. I’m not sure whether I’m up to using the iPad for recording music or as a playback sampler device yet as I prefer not to use computers on gigs or during performances, but that may eventually change. For now I’m extremely happy to be able to just read up on the synths when waiting out in the car or scrub through keyboard instruction videos as I play new material. The iPad is very portable and I look forward to learning more about it. If anyone has any tips or recommendations for iPad music applications, please leave a comment. Thanks!! The following iPad app mobileRhythm mR-7070 looks pretty cool. It appears to have MIDI in, out and MIDI clock out. It is has midi export that would be awesome, but not sure. Last week I was at a used music shop in Nagano-city Japan where I bought a Roland Juno 106S which I posted about in a previous article below. 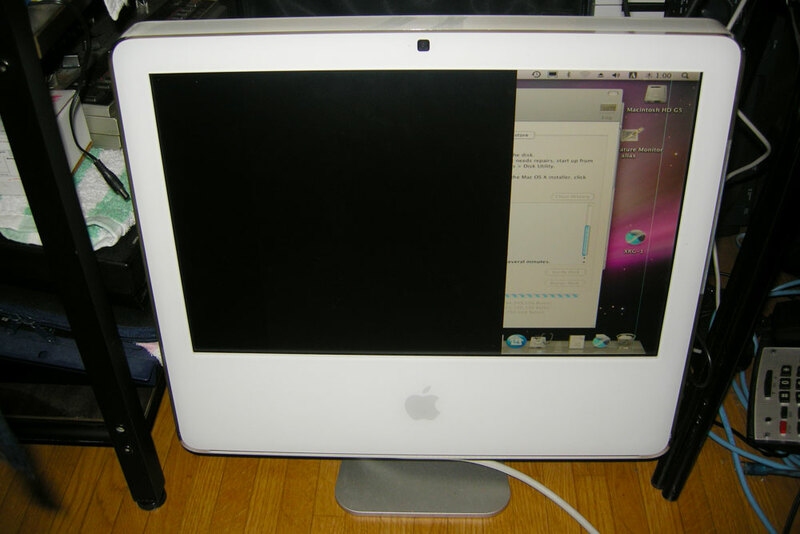 During that time I found a used Apple iMac G5 1.9 Ghz computer for sale. The main problem though was that the screen was messed up as you can see in the photo. The sales clerk was nice enough to actually give me the iMac G5 after I bought the Roland synth. Thus I basically went home with a free Apple iMac G5. I do have problems with it though and I’ll post some details here. First the Apple iMac PowerPC G5 is a 1.9Ghz with a 160GB HD and 512MB Ram. The serial number is W85422xxxxx and it has Mac 10.5.8 OS loaded inside. I access the computer using an apple keyboard, mouse, and an external PC VGA monitor hooked up with an apple VGA connector cable. The computer basically works pretty good when using an external monitor. The two main problems though are one, the computer screen is pretty much shot. You can see some vertical lines on the right hand side and the left is just totally black or Gray sometimes. Another big problem is that this computer runs pretty hot. In fact, I cannot get the internal (3) fans to work at all when running in normal mode. If I reboot into single user mode the fans will run at full speed of course. I just can’t get the fans to run at all during normal operation which is likely why the computer is running hot. The logic board or something is not controlling the fans properly. I installed a software application called “Temperature Monitor” and here are some results after one hour of basic usage. Note that I have applied the setting “Reduced” in Energy Saver Preferences. All temperatures are in Celsius…I repeat in Celcius!! Those temperatures to me seem to indicate the computer is running VERY hot. Unfortunately there are no software solutions to control the fans like with G4 computers so I either have to get something fixed, replaced, or find an external cooling method. The hottest point on the computer is the upper left hand side when facing the front of the screen. That area is where the Power Supply sits if correct. That area gets extremely hot but all other areas are actually not too bad. Yet when I look inside I can’t find any obvious problems in that area. Yesterday I spent a couple of hours taking the iMac G5 completely apart. Inside I found the Power Supply to be completely intact. The capacitors showed no signs leaking. There were no bulges at the ends of the capacitors which actually looked pretty good. In addition, I removed the logic board because I knew the G5 has been plagued with logic board failures. Again, the logic board capacitors all looked brand new with no signs of bulging or rounded ends. In fact, everything looked great inside so I’m really wondering what could be the problem. I put the computer back together a bit disappointed that I couldn’t any obvious problems. Likely at this point the problem could be anything from the logic board, PSU, graphics boards, or screen etc. The computer runs very well for about an hour and then I feel I need to shut it down because I don’t want it to get too hot and cause a meltdown. I don’t think it’s worth it to dump any additional money into the computer as I really don’t know what’s wrong with it yet. I could refurbish the logic board and replace all the capacitors. Perhaps that might fix the fans and if lucky kick in the monitor again. I’m not sure yet. I’m posting this article here because I’ve really done a lot of research on this over the past few days and found very few people with my symptoms. It seems most people with Apple iMac G5 have fans that are too loud, hundreds of vertical lines on the screen, or G5 computers that just shut down intermittently. I do know that the Logic Board is connected with fan usage and the screen. Whether the capacitors have something to do with this I don’t know. It’s puzzling. I WISH I had the loud, full speed fan problem that 99% of other iMac G5 users have. That would at least help my overheating problem…laugh. For now the free iMac G5 that I got has not cost me any additional money yet. I can get a solid hours worth of special app work done if needed. I can rip the hard disk and possibly even the super drive. I also got an Apple keyboard and mouse so that’s worth something there of course. Parting it out might be the best bet, but I’ll likely just let it sit there and continue to investigate what might be the probable cause. There are a TON of people who have issues with the iMac G5 series computers. Looking at what I have here, I’m so glad I didn’t dump my money into one of these. I’d be pretty upset if these symptoms happened after shelling out lots of money. It just reminds me that despite all the glory of Apple lately, they do use crappy components in some of their products like most companies likely do as well. It’s a shame Apple customers have had to deal with all of these G5 problems. Hopefully the new Intels are much better which I have yet to purchase. I’m getting there, but these G5 issues are starting to make me wonder. I’ll post updates as I find additional info. Stay tuned!